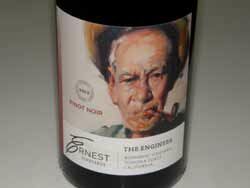 Sonoma Coast Pinot Noir and Chardonnay crafted by winemaker Kent Humphrey (Eric Kent Wines). Todd Gottula is co-owner and a lover of the wines of Burgundy. He has been in the wine business since 2008 and has developed relationships with winegrowers and wine producers. The other co-owner and chief proprietor of Ernest Vineyards is Erin Brooks whose background is in sales and marketing. The brand is named after Ernest Gottula, Todd's paternal grandfather. Ernest and his maternal grandfather, Ray Chute, are Air Force and SeaBee veterans respectively. To honor them, a percentage of every sale is given to the Veterans of Foreign Wars. The wines are offered through a mailing list.